Hosting your wedding at a barn venue doesn’t mean it has to be rustic. Jasmine and Tiernan’s September wedding is proof of that! Their wedding is one of the most popular on Pinterest and the one most often referred to when couples tour the barn. It’s truly an inspiration for anyone wanting to add glamour and a modern flair to their wedding day. Before we get started on the details of their day, we want to wish Jasmine and Tiernan a huge congratulations on the arrival of their new baby boy! We are so excited for you both and baby S is one lucky baby to have you as parents! One more shout out to Courtney Wilkerson of Twinkling Eye Photography for all these amazing photos. Thanks to your talent we can drool over this wedding for years to come! This fashionable, trendy Atlanta couple truly had a way of bringing style and flair to their wedding day. There are so many details to fawn over! The hard part is knowing where to start. This couple and their wedding part looked like they just walked out of a magazine. Jasmine’s gorgeous beaded dress fit her like a glove. Beading draped her arms and was as unique and beautiful as Jasmine. Her dress was perfectly paired with her bridesmaids’ dresses that were various hues of blush and taupe and adorned with delicate beading. Add to that their jaw-dropping bouquets filled with roses of soft pinks, eucalyptus and pops of blue. The guys were looking sharp in their straight leg navy suits and blush ties. Tiernan was decked out in a tailored suit and bow tie. Add to that his cool glasses, dapper hairstyle and huge smile, he was a photographer’s dream groom! Then there was her adorable flower girl dressed in a sparkly blush dress and Jasmine’s nephew who was seriously the cutest ring bearer ever, walking down in his tiny suit and aviator sunglasses. We are not sure who stole the show, Carson or Jasmine & Tiernan’s tutu-wearing pups! They skipped down the aisle, eagerly awaiting their mama’s arrival. Furi and Bella were as cute as they were perfectly behaved. Jasmine & Tiernan created the most beautiful ceremony area, a blend of our decor and pews as well as rentals from Shabulous Southern Rentals. We loved that the wedding party and couple walked through wooden doors decorated with fabric and a chandelier. Flanked on each side were whiskey barrels, personalized signage and dramatic floral arrangements designed by Cyndi of Twigs, Leaves and Flowers. The meeting point at the end of the aisle, in front of our grand pecan tree, was a large wooden cross. The combination of natural beauty and Christian symbolism created a perfect backdrop for this sweet couple’s vows. This detail is one of the most envied setups still to this day! 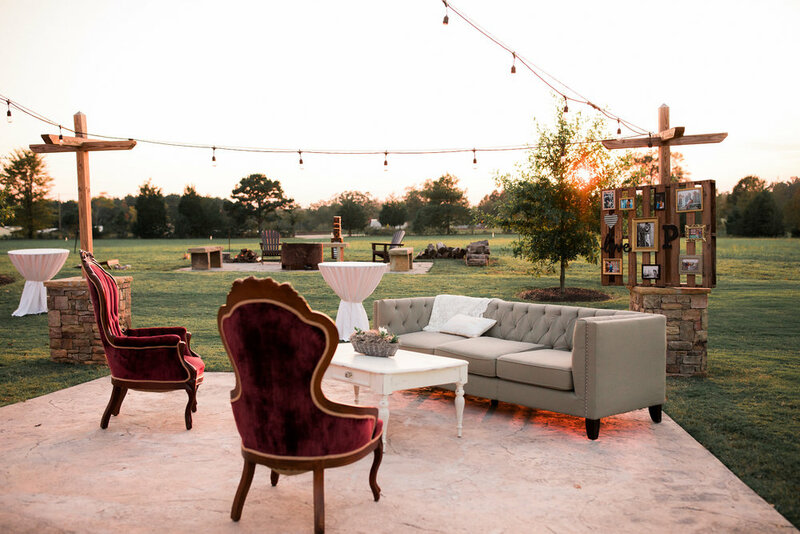 Renting furniture from Shade Tree Rentals, Jasmine and Tiernan brought glam and style to their outdoor cocktail hour. Thankfully for all of us, Mother Nature provided the most beautiful fall day for their wedding. Regal red velvet armchairs, a gray couch and antique coffee table was the ideal spot to enjoy a cocktail and watch the sun set. Surrounding the seating area were cocktail tables, handcrafted signage and outdoor lawn games. Such a fun night for all their guests. ﻿Even the food truck was adorable! Jasmine and Tiernan’s September Georgia wedding had another first for us…a food truck! Mac the Cheese was the caterer of choice and they served the most amazing versions of mac & cheese we’ve ever had. We are still craving the lobster mac & cheese! Jasmine and Tiernan once again combined their style, our decor and Cyndi’s floral talents and designed a stunning, dramatic and sparkly wedding reception! 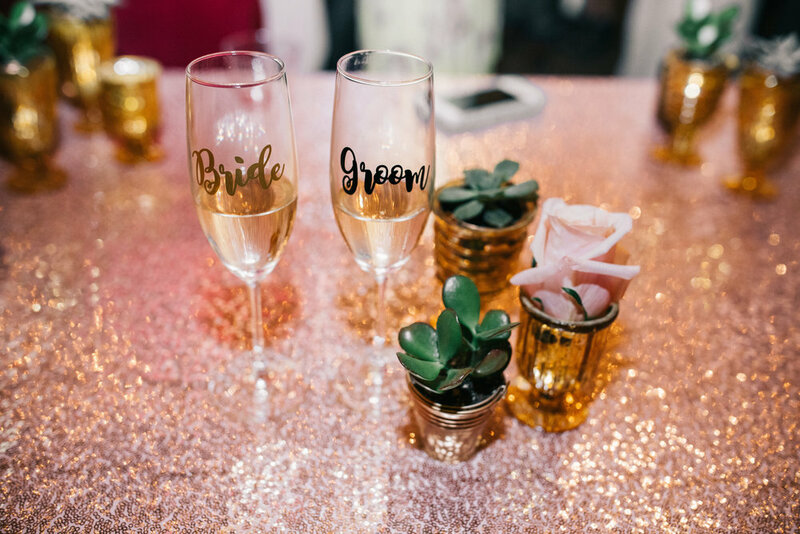 On top of the soft pink and ivory linens, lay a blush sequin runner, baby succulents, a mix of bronze and gold lanterns, metallic votives, terrariums and milk glass. The varying combinations made each table unique but so coordinated it was beautiful as a whole or as an individual table. The night was filled with dancing, laughing and so much celebration from a room filled with loved ones that traveled from near and far. Many of their guests came from California and it was a night treasured by all. ﻿The tiniest of details make the biggest difference. While all the setups, backdrops and designs were the perfect representation of Jasmine & Tiernan’s style, it was the little details that Jasmine thought of that tugged at the heartstrings. To know them is to love them and it shouldn’t surprise anyone that with her kind heart, our sweet bride made everyone feel special on her wedding day. From the embroidered handkerchief for her dad, keepsake vow books for the couple to share and their gifts to the wedding party, each person felt touched and loved and to this day no doubt treasures a memento from this gorgeous September wedding. Talented vendors made this day so memorable. From the amazingly talented Courtney who captured all these breathtaking photos, to Cyndi’s luscious florals, the delicious eats from Mac The Cheese, all the best tunes and dance party by Dillon Maurer, it was all (thankfully!) recorded in a touching video created by Connor Price Videography. All the pretty beauty details, think makeup and hair, were done by Bombshell Creations By Laura Maher and TracyB Hair Studio respectively. Want to see this all in motion, click below to view Conner’s video but grab a notebook first. We have no doubt you’ll find inspiration in this perfect September wedding! If you are planning a fall wedding, we have the blog post for you. It includes all the tips and tricks to consider for your perfect day. Click here to read more!